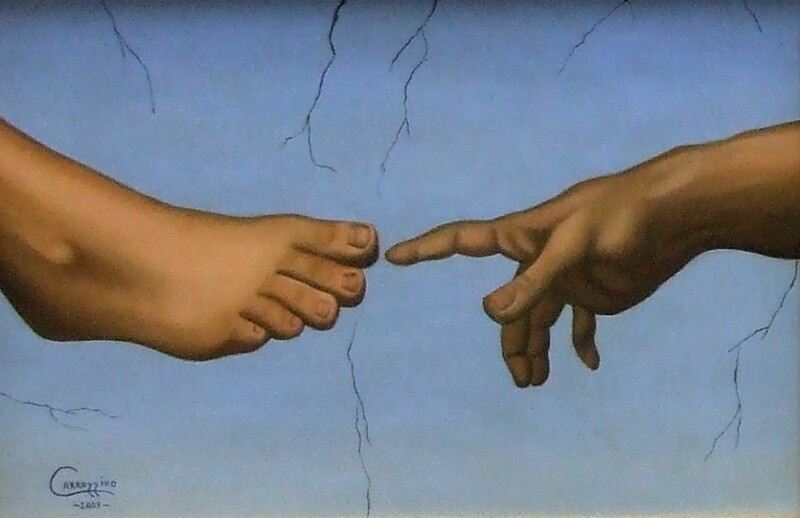 “Hand to Foot” by David Carrozziono, inspired by Michelangelo. 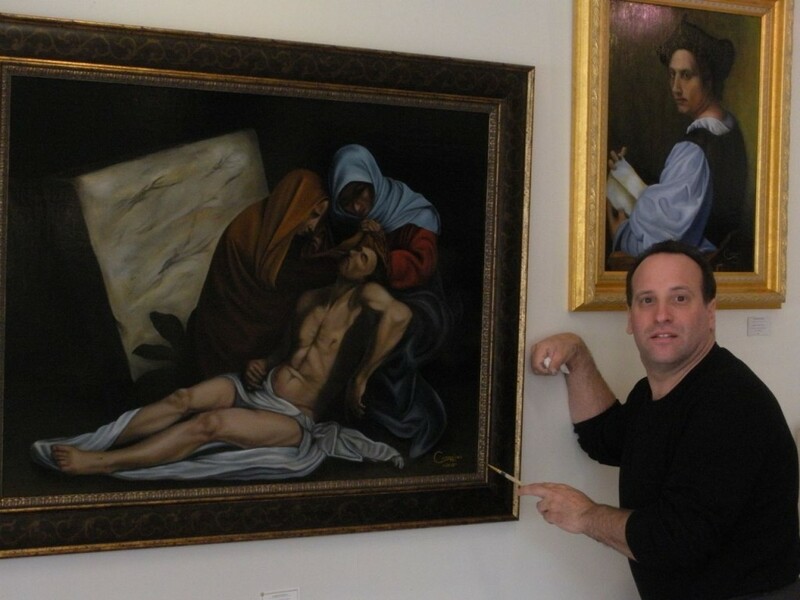 Meet Dr. David D. Carrozzino, Podiatrist…and Classical Artist! 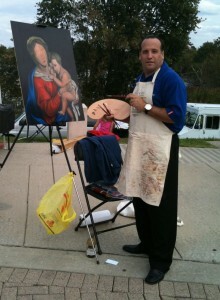 David giving a painting demonstration at the Italian Heritage Festival of Gloucester County, October 2010. Many of us have hobbies we enjoy pursuing in our free time. 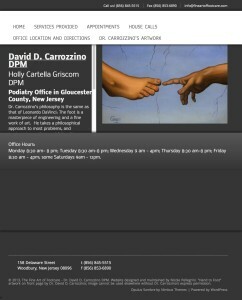 For Dr. David D. Carrozzino, a podiatrist practicing in Woodbury, New Jersey, that hobby is classical oil painting. David’s passion for art, particularly the art of the Italian Renaissance, has been an important part of his life for many years. His love for classical art has lead him to travel to Italy many times, to study in art workshops around the world, and to build an extensive library of books devoted to the Renaissance and painting techniques. David also just happens to be my fiancé, so I recently took advantage of our close relationship to interview him about his love for art: what captured his interest in the subject, who are his greatest art inspirations, and how he balances painting with his professional life as a physician. Dr. Carrozzino first became interested in art during his freshman year in college – in fact, it was due to a girlfriend of his at the time (and no, I don’t mind him telling that story!) She had a book in her living room on Italian Renaissance art which captured David’s interest, which soon blossomed from that first exposure to the subject of classical painting. While in podiatry school in Philadelphia, Pennsylvania, David lived near the South Street Art store. One day he bought a simple oil painting starter kit to attempt to paint a Christmas gift for his parents. The experience got him hooked on painting – and that first work of art still hangs in the family room of his parents’ house. 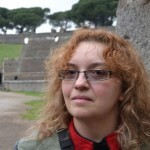 Why Art as a Pastime, and Why Classical Art? 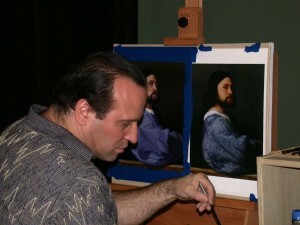 David working on a copy of a Titian original. When asked what he enjoys the most about the painting process, David said the process of mixing his colors is an especially rewarding challenge. He often uses the mixing technique and approach of Frank Covino and the “controlled palette,” but he is also constantly experimenting with other methods and ways to mix color as well. David also enjoys the act of creating a three-dimensional image on a two-dimensional canvas, and simply finds painting extremely relaxing after a long day in the office or out on the road for house calls. Classical art appeals to him more so than modern or abstract work because he admires the depth, color and realism of Old Master artwork, as well as the work of other artists today who paint using traditional methods. Of his own work, David names his version of “The Pieta” as his favorite painting to date. It currently hangs in the waiting room of his office in Woodbury, New Jersey and it has certainly gained considerable praise and interest from his patients – and the surrounding community. On more than a few occasions, people from the area have come in to the office just to view the work, having heard “through the grapevine” about it. David with his Pieta, and in the background “The Navigator” – based on an original work (detail) by Andrea del Sarto . Controlled Painting by Frank Covino. David has taken many art workshops and classes, from The Pennsylvania Academy of Fine Art in Philadelphia (where we actually first met!) 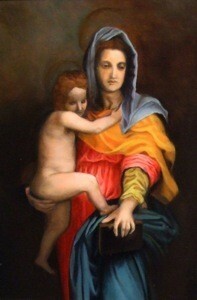 to The Angel Academy of Art in Florence, Italy. Of all the classes he’s taken, he sites Frank Covino‘s workshops as the most valuable in developing his technique and approach to painting. He would recommend one of Frank’s classes to anyone who is interested in classical painting and the work of Old Master artists, although he highly encourages people to read Frank’s books and watch some of his video tutorials first to get a taste for Covino’s methodology. 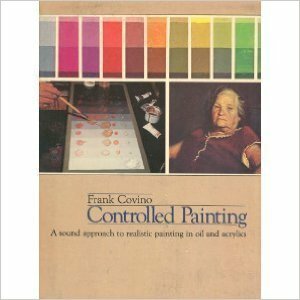 Frank Covino’s “Controlled Painting” is the best book with which to begin, if you are interested in his controlled palette approach to classical art. Underdrawing, underpainting, flesh tones, glazing and principles of composition are all discussed in great detail. It’s a must for any artist who wishes to take a methodical, almost scientific approach to realistic painting. David sites Venetian painter Lorenzo Lotto as the artist who inspires him the most. Lotto, who trained with Giorgione and Titian in the studio of Giovanni Bellini, had a unique style somewhat apart from the traditional school of Venice. Yet his eye for detail and color was extraordinary, making his work worthy of far more critical attention than it regularly receives. David is also a tremendous admirer of Leonardo da Vinci, both for his artistry and his scientific work. 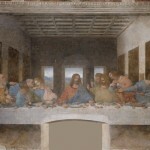 If he ever had the chance to speak with Leonardo today, David says he would want to know, first, how he completed his underpaintings for famous works such as the “Mona Lisa” and “Ginevra de’ Benci.” Then, from a medical standpoint, he would love to ask Leonardo about how he found the time (and got around societal taboos and laws) to complete his highly detailed, groundbreaking anatomical drawings. Of all the artwork in the world he has seen, however, David states none have had as much impact on him as Michelangelo’s Sistine Chapel. He has been fortunate enough to visit the Chapel both before and after the impressive – and controversial – cleaning of the frescoes. As a supporter of The Patrons of the Arts in the Vatican he was even able to view it in a private session before general public admission, a truly inspiring event and opportunity. One of David’s fresco panels. 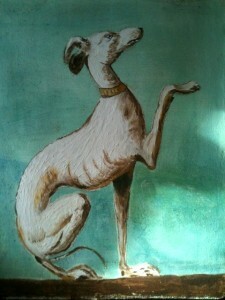 Besides oil painting, David loves the technique of fresco painting, in which pigment is mixed with water and painted on a thin layer of wet, fresh, lime mortar or plaster. 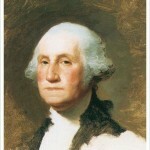 He has not only studied fresco techniques extensively through workshops and literature, but even co-taught a class on the subject at Camden Community College for a semester with artist Robert Waddington (of the Pennsylvania Academy of Fine Arts). David finds the speed at which one must work in fresco to be an extreme challenge, as once the wet plaster dries you cannot rework your image at all without completely chipping it away from the wall. Fresco is not at all like oil painting, he says, but that is part of what makes it so unique and fun to explore. When in Italy, David is always on a quest to seek out great fresco artwork in churches, palaces and tiny streetside altars. 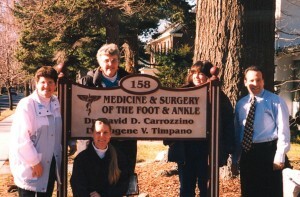 David and staff outside of his podiatry office. David has many of his paintings on display in his medical office – which as mentioned sometimes can cause quite a response from patients and other visitors. One comment he frequently hears from patients is, “I feel like I’m in a museum!” Many others ask him why he is still practicing when he is such an accomplished artist. Of course, any one who attempts a career in art knows that it is an extreme challenge today and financially quite risky – the patronage system of the Renaissance is far behind us. And David says he likes medicine and interacting with his patients too much to give it up completely for art. He is happy to keep balancing his medical career and his hobby as an artist for now. That said, his one lifetime goal as an artist would be to have one of his paintings someday hanging in a museum – or even a church. 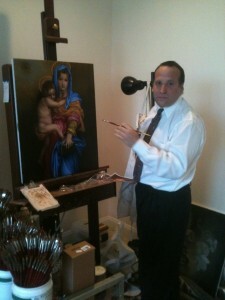 David working on a Madonna and Child reproduction in his home studio. I can assure all readers of this article that there is rarely a day that David doesn’t spend at least several hours painting away in our home studio. He typically will have at least a half dozen canvases and panels in various stages of completion at any one time, sometimes putting a piece aside for months before retuning to finish or fix the details. He will paint late into the night and even early in the morning, trying to get in a few brushstrokes before leaving for the office. Between his work and mine, there is never any shortage of artwork in our home – although we have a lot of wall space left to cover! We enjoy taking visitors on a tour of our painting workspace and the many works on display, and hope to one day work on a large scale fresco or mural to truly bring the feeling of the Italian Renaissance into our home. If you’re looking for a good podiatrist in Gloucester County, New Jersey, please visit Dr. Carrozzino’s website The Fine Art of Footcare to find out more. Office location, hours, services provided and appointment contacts are all provided on the site, along with a gallery of David’s artwork, of course! Dr. Carrozzino and his staff will be happy to help you with all manner of treatment including routine diabetic exams, warts and fungus, wound care, bunions and more. House call appointments are available for those with limited mobility as well. And of course, the doctor will be happy to talk art as well as medicine when you come in for a visit!